"An exquisite hangout movie." The Cinema Guild has debuted an official US trailer for the film Grass, one of the latest works from prominent Korean filmmaker Hong Sang-soo. This originally premiered at the Berlin Film Festival last year, and also played at the Busan and New York Film Festivals last year, but is only now getting a release in US cinemas. Grass is Hong Sang-soo's fourth feature film over the last two years - following On the Beach at Night Alone, which also premiered at the Berlin Film Festival, as well as The Day After and Claire's Camera. This one, also shot in black & white, is about a young Korean woman, played by award-winning actress Kim Min-hee, who sits at a cafe in the corner writing on her laptop about people she sees around here and their interactions. Seems like a good time, offering some nice insight. It's only 68 minutes, a quick watch if you're curious about it. Though this is a strange trailer, as usual with Hong's films. You can still watch the first teaser trailer for Hong Sang-soo's Grass here, for the original tease. Grass is another cheerfully melancholy story about the guests at a small café whose owner loves classical music. Kim Minhee, who won the Silver Bear for Best Actress in 2017, plays a café regular who always seems to be at the table in the corner writing on her laptop. She repeatedly draws inspiration from what’s happening around her, picking up the threads of the dialogue and spinning them further and sometimes even actively intervening in conversations. Is she perhaps the author of these relationship dramas in miniature, whose stores and themes mirror one another? Grass is written and directed by veteran Korean filmmaker Hong Sang-soo, also known as "the Woody Allen of Korea", of many films previously including Woman on the Beach, Lost in the Mountains, The Day He Arrives, In Another Country, Hill of Freedom, Right Now Wrong Then, Claire's Camera, and On the Beach at Night Alone. This premiered at the Berlin Film Festival last year, and also played at the Hong Kong, Busan, and New York Film Festivals. 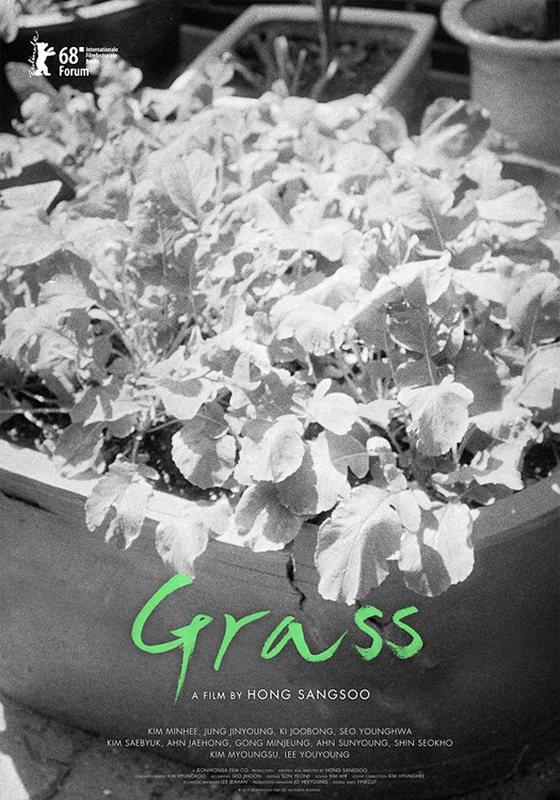 The Cinema Guild will release Hong Sang-soo's Grass in select US theaters starting on April 19th next month. Curious?